We theoretically study third harmonic generation in silica microfiber loop resonators wherein the large resonant field strength is exploited to increase the efficiency and reduce the required pump power, with a focus on the influence of loop parameters such as loss and coupling. For a 3 mm length loop, the conversion can reach several percent, that is, 640 times greater than an equivalent straight microfiber, for input powers as low as 100 W. The harmonic signal can be toggled between a high- and low-output state due to hysteresis at higher powers, and the efficiency can be further enhanced if the harmonic light is recirculated and coresonant with the pump. R. R. Gattass, G. T. Svacha, L. Tong, and E. Mazur, “Supercontinuum generation in submicrometer diameter silica fibers,” Opt. Express 14, 9408–9414 (2006). S. Leon-Saval, T. Birks, W. Wadsworth, P. St. J. Russell, and M. Mason, “Supercontinuum generation in submicron fibre waveguides,” Opt. Express 12, 2864–2869 (2004). A. Coillet, G. Vienne, and P. Grelu, “Potentialities of glass air-clad micro-and nanofibers for nonlinear optics,” J. Opt. Soc. Am. B 27, 394–401 (2010). 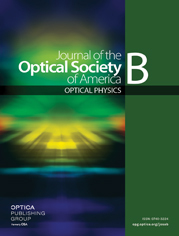 S. Richard, “Second-harmonic generation in tapered optical fibers,” J. Opt. Soc. Am. B 27, 1504–1512 (2010). J. Lægsgaard, “Theory of surface second-harmonic generation in silica nanowires,” J. Opt. Soc. Am. B 27, 1317–1324 (2010). U. Wiedemann, K. Karapetyan, C. Dan, D. Pritzkau, W. Alt, S. Irsen, and D. Meschede, “Measurement of submicrometre diameters of tapered optical fibres using harmonic generation,” Opt. Express 18, 7693–7704 (2010). D. Akimov, A. Ivanov, A. Naumov, O. Kolevatova, M. Alfimov, T. Birks, W. Wadsworth, P. Russell, A. Podshivalov, and A. Zheltikov, “Generation of a spectrally asymmetric third harmonic with unamplified 30 fs Cr: Forsterite laser pulses in a tapered fiber,” Appl. Phys. B 76, 515–519 (2003). V. Grubsky and J. Feinberg, “Phase-matched third-harmonic UV generation using low-order modes in a glass micro-fiber,” Opt. Commun. 274, 447–450 (2007). V. Grubsky and A. Savchenko, “Glass micro-fibers for efficient third harmonic generation,” Opt. Express 13, 6798–6806 (2005). T. Lee, Y. Jung, C. A. Codemard, M. Ding, N. G. R. Broderick, and G. Brambilla, “Broadband third harmonic generation in tapered silica fibres,” Opt. Express 20, 8503–8511 (2012). A. Coillet and P. Grelu, “Third-harmonic generation in optical microfibers: from silica experiments to highly nonlinear glass prospects,” Opt. Commun. 285, 3493–3497 (2012). N. G. R. Broderick, M. A. Lohe, T. Lee, and S. Afshar V., “Analytic theory of two wave interactions in a waveguide with a χ(3)nonlinearity,” in Proceedings of the International Quantum Electronics Conference and Conference on Lasers and Electro-Optics Pacific Rim 2011, (Optical Society of America, 2011), p. I366. M. Corona, K. Garay-Palmett, and A. B. U’Ren, “Third-order spontaneous parametric down-conversion in thin optical fibers as a photon-triplet source,” Phys. Rev. A 84, 033823 (2011). M. Corona, K. Garay-Palmett, and A. B. U’Ren, “Experimental proposal for the generation of entangled photon triplets by third-order spontaneous parametric downconversion in optical fibers,” Opt. Lett. 36, 190–192 (2011). S. Afshar and T. M. Monro, “A full vectorial model for pulse propagation in emerging waveguides with subwavelength structures part I: Kerr nonlinearity,” Opt. Express 17, 2298–2318 (2009). R. Ismaeel, T. Lee, M. Ding, M. Belal, and G. Brambilla, “Optical microfiber passive components,” Laser Photon. Rev. (to be published). C. Caspar and E. J. Bachus, “Fibre-optic micro-ring-resonator with 2 mm diameter,” Electron. Lett. 25, 1506–1508 (1989). M. Sumetsky, Y. Dulashko, J. Fini, A. Hale, and D. DiGiovanni, “The microfiber loop resonator: theory, experiment, and application,” J. Lightwave Technol. 24, 242–250 (2006). X. Jiang, L. Tong, G. Vienne, X. Guo, A. Tsao, Q. Yang, and D. Yang, “Demonstration of optical microfiber knot resonators,” Appl. Phys. Lett. 88, 223501 (2006). M. Sumetsky, “Optical fiber microcoil resonators,” Opt. Express 12, 2303–2316 (2004). G. Brambilla, V. Finazzi, and D. Richardson, “Ultra-low-loss optical fiber nanotapers,” Opt. Express 12, 2258–2263 (2004). L. Tong, R. R. Gattass, J. B. Ashcom, S. He, J. Lou, M. Shen, I. Maxwell, and E. Mazur, “Subwavelength-diameter silica wires for low-loss optical wave guiding,” Nature 426, 816–819 (2003). J. S. Levy, M. A. Foster, A. L. Gaeta, and M. Lipson, “Harmonic generation in silicon nitride ring resonators,” Opt. Express 19, 11415–11421 (2011). Z. Yang, P. Chak, A. D. Bristow, H. M. van Driel, R. Iyer, J. S. Aitchison, A. L. Smirl, and J. E. Sipe, “Enhanced second-harmonic generation in AlGaAs microring resonators,” Opt. Lett. 32, 826–828 (2007). Z. Bi, A. W. Rodriguez, H. Hashemi, D. Duchesne, M. Loncar, K. Wang, and S. G. Johnson, “High-efficiency second-harmonic generation in doubly-resonant χ(2) microring resonators,” Opt. Express 20, 7526–7543 (2012). T. Carmon and K. J. Vahala, “Visible continuous emission from a silica microphotonic device by third-harmonic generation,” Nat. Phys. 3, 430–435 (2007). G. Vienne, Y. Li, L. Tong, and P. Grelu, “Observation of a nonlinear microfiber resonator,” Opt. Lett. 33, 1500–1502 (2008). K. S. Lim, A. A. Jasim, S. S. A. Damanhuri, S. W. Harun, B. M. Azizur Rahman, and H. Ahmad, “Resonance condition of a microfiber knot resonator immersed in liquids,” Appl. Opt. 50, 5912–5916 (2011). OSA participates in Crossref's Cited-By Linking service. Citing articles from OSA journals and other participating publishers are listed here. Alert me when this article is cited. Fig. 1. Schematic of the microfiber loop resonator. The amplitudes in the two arms of the coupling region are denoted A1(s) and A2(s), and the amplitudes in the loop are A0(s). Fig. 2. Pump Pω and third harmonic P3ω output power from a loop resonator when input pump power P0 is (a) 100, (b) 250, and (c) 600 W. The labeled dots indicate the position of the detunings for the transfer characteristics shown in Fig. 3. Parameters: L0=3 mm, Lc=50 μm, αω,3ω=5 m−1, κ=8×104 m−1, and δβ≈1440 m−1. Fig. 3. Transfer characteristics when the pump is detuned from resonance by (a) 50, (b) 96, (c) 100, and (d) 120 pm. Other parameters are the same as in Fig. 2. Fig. 4. Enhancement ζ against detuning δλω for different proximities to critical coupling ΔK (equivalent to 6.5×104 m−1<κω<8.2×104 m−1. Regions where ζ>1 generate a greater third-harmonic conversion than an equivalent straight microfiber. The dotted line at ΔK=0.71 corresponds to the situation in Fig. 2(a), when κω=8×104 m−1. P0=100 W, and other parameters are the same as in Fig. 2. Fig. 5. Maximum internal pump power on resonance inside the loop, Pcirc/P0, for different proximities to critical coupling ΔK and loss. P0=100 W, and other parameters are the same as in Fig. 2. The inset confirms the cubic pump dependency of the enhancement over the range of values simulated. Fig. 6. (a) Resonant enhancement factor ζ of the third harmonic power and (b) bandwidth of the enhancement (taken as the full width measured halfway between ζ=1 and maximum ζ) for different proximities to critical coupling ΔK. P0=100 W, and other parameters are the same as in Fig. 2. Fig. 7. Third-harmonic conversion against detuning, when the harmonic light is partially recirculated (i.e., with κ3ω>0 m−1). P0=100 W, and other parameters are the same as in Fig. 2.